Oscar-winnerChristoph Waltz is reteaming with his "Inglourious Basterds" writer-director, Quentin Tarantino, for a Western to be shot later this year in Italy and Spain, according to Ain't It Cool News. Word of the project first broke via an interview Italian actor Franco Nero recently did with Movieplayer. The weird grammar is a result of bad machine translation, and not a shortcoming on Nero's part, the title, however is inexplicably wrong, according to AICN, who says they don't know what the title is, but have been assured it is nothing like "The Angel, The Bad And The Wise." 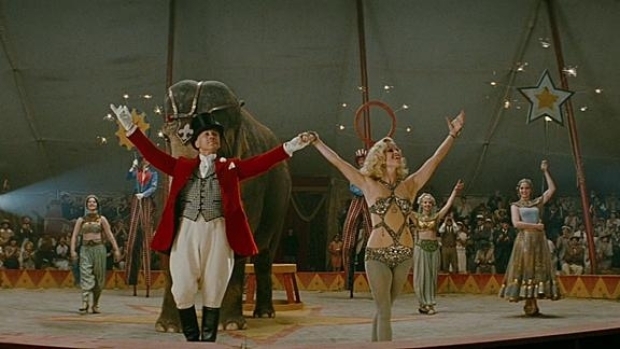 Robert Pattinson plays a young man (played as an old man by Hal Holbrook) who joins the circus, where he falls in love with the beautiful Reese Witherspoon, who is, of course, married to the much older, animal-abusing ring master played by Christoph Waltz. Based on Sara Gruen's bestseller novel, directed by Francis Lawrence, the film opens April 15. Waltz, who was one of the few good things about "The Green Hornet," can next be seen in "Water for Elephants," as an abusive animal trainer for a circus whose beautiful young wife, Reese Witherspoon, finds herself attracted to the a young veterinarian played by Robert Pattinson. The Austrian actor took home the Best Supporting Actor Oscar in 2010 for his role as SS Colonel Hans Landa in Tarantino's WWII epic.